Impressing your goals and idea of success on your mind is a key component of achieving what you want in life. This article will show you how to use affirmations to take action for goals and success. 1 What are affirmations and how do they help success? 4 What is the difference between affirmations and goals? 5 How do you write great affirmations? What are affirmations and how do they help success? Impressing your goals and images on your mind is a key component of my formula for success….achieving what I want from life. Affirmations are simple, memorable, over-the-top statements that you read and/or listen to multiple times per day. The goal is to begin believing whatever the affirmations tell you. For example, if you believe your $20,000 per year salary is normal and that a $100,000 per year salary is unachievable, you need an affirmation. The affirmation will be one component of your metamorphosis from a $20k earner to a six-figure earner. Affirmations allow you to replace doubtful, negative, or uncertain, this is normal, and “can’t do” thoughts and replace them with positive, affirmative, that can be my normal, and “can do” thoughts. Read my mega article on affirmations here: How to Use Affirmations: The Ultimate Guide (The Naysayers are Wrong). 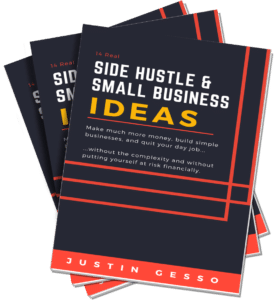 You’ll get some great information and stats from studies along with practical tips. Affirmations are also a key part of the foundation to how I quit the corporate life. You can read about it in my bestseller Leave Grind Behind. Without first truly believing something is possible, you will not begin taking the other steps and actions in your life that lead to actual change. And this is really the key, if you first talk your mind into believing something is possible, then you take action and achieve even a small result reinforcing this possibility, you have now completely altered what is possible for you. This article will show you how to use affirmations to take action toward massive goals. Many big goals are difficult to imagine accomplishing. You may have no idea how you will accomplish them. Other people may reinforce this by chuckling at your goals. You may not know anyone who has accomplished them. In these circumstances, what are the chances you will actually begin making the right changes in your life to ultimately accomplish these big goals? Affirmations allow you to close this gap, change your belief, and begin taking meaningful actions. They are the first step to change. Affirmations are magical. I have written down a lot of crazy things. Things that seemed completely unreasonable. But like clockwork, after days, weeks, or months of reading them daily, something magical happens. Suddenly the idea I had written down doesn’t seem crazy. In fact, I now have several inspired ideas of how to accomplish the goal. Perhaps I’ve met a person who has already accomplished it and now we’re in communication. Or maybe I’ve found a book that provides the information I was missing. Whatever it is, I’ve tricked my subconscious into working for me and solving a massive problem, which is a bigger scale version of what I describe in my article 4 Steps on How to Delegate to Your Subconscious. What is the difference between affirmations and goals? Do you think you’re a bad public speaker? Flip that negative into a positive, written affirmation, and alter your belief. Personally, I can get too caught up in analysis and research, even though I have all I need to take action. I need to get going, take action, start earlier, and adjust as I go. To counter this problem, I have an affirmation saying: “I take action. Ready, fire, aim. I am action-oriented!” This reminds me to fire, adjust my aim, and then fire again. Other people may need to slow down and do more research, but for me, I need to teach myself that I’m action-oriented, and this affirmation has made a difference. I have a goal to reach a high degree of wealth, while also feeling very fulfilled and having plenty of time for friends, family, and community. In my previous role, this seemed impossible. Everyone I knew was working very long hours. They were stressed. It was normal to have to chug your way up the chain in order to achieve only the wealth side of the equation. While they and I were making good money, it was not enough to reach my goal on salary alone. Given the time commitment, it was difficult to pursue other options for growing wealth. And I certainly wasn’t achieving the work-life balance I wanted. All of this made achieving my goal seem insanely difficult, or even impossible. The environment I was in and the people I was around all contradicted the goal and painted a different reality. Enter affirmations. I continued to tell myself that despite what I was seeing day in and day out, my goal was possible. How did this turn out? I’m not there yet, but I found someone who is actually living very close to my goal. I left my job and am learning from him. I am now far closer to my goal than I ever was before. I am literally in a new reality. I level jumped. Since my subconscious was primed, as soon as the opportunity presented itself, I was able to recognize what it was and act on it. Thank you affirmations. The truth is, there are many, many people who have already achieved the same goal I have. I just needed to see that. If you think your goal is impossible, rare, difficult, or something only available to a select few, get some affirmations in gear to get over those negative, and most importantly, false beliefs. How do you write great affirmations? Step 1: Think about your goals. For each goal, what belief keeps you from taking action today? What belief keeps you from making your goal much, much bigger? Focus on this belief. We want to change it! e.g. I cannot make a lot of money without working excessively. Or I cannot have a successful marriage and a highly successful career. Step 2: Alternatively, identify negative self-images or negative thoughts you have about yourself. e.g. I am overweight. Or Nobody at work respects my opinion. Step 3: Now, turn your belief on its head and define how you want the world to work. e.g. I can make a lot of money without working excessively. Or I can have a successful marriage and a highly successful career. Or I am beautiful and at a perfect, healthy weight. Or People at work highly respect my opinions. Step 4: Start your affirmation with “I am…” Affirmations are about altering your beliefs; you are in charge of yourself. Step 5: You are in charge–don’t limit yourself. You say how the world works. Don’t think your affirmation is ridiculous. Step 6: The wording should be positive rather than negative. Step 7: Add emotion and feeling words to make it more memorable. Step 8: Affirmations can overlap heavily with goals. If you don’t feel you have a belief holding you back from achieving a goal in a particular area of life, go ahead and jot down a measurable goal. But if you’re not taking action on the goal, dig deeper and create an affirmation to get the ball rolling. 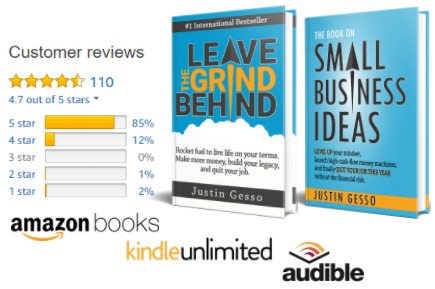 Get my bestseller Leave Grind Behind.